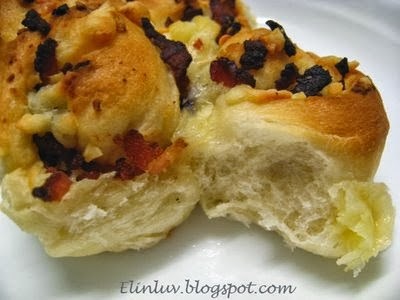 Since I could not bake for the time being...and am recuperating at home until the arm movement is fully recovered, I will cleaning up and shifting all my baking posts from Elinluv's Tidbits Corner to here :) Bacon and Cheese Rolls are my Piggies favorite rolls. I used to bake these for them when they were in college and imagine , they practically grew up eating homemade buns. 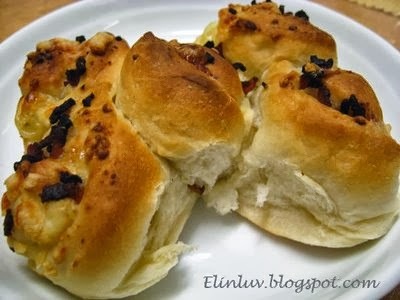 Homemade buns are indeed yummilicious and have no preservatives and most important I enjoyed making them. Now is the time for me to reminisce all those lovely homemade buns that I baked for them when they were in college and I hope you too will have fun baking them. 1. Put the flour, the sugar and yeast in a bowl, whisk to combine, add salt whisk again. Pour the milk into the bowl. 2. Use a large spoon ( or pastry scraper) to mix everything together, and knead briefly to bring all the ingredients together. 3. Add the butter and knead by using the heel of your hands to compress and push the dough away from you, then fold it back over itself. Give the dough a little turn and repeat. Put the weight of your body into the motion and get into a rhythm. Keep folding over and compressing the dough. Knead for 10-15 minutes or until the dough is soft, pliable, smooth and slightly shiny, almost satiny. Or you can also try stretching part of the dough, if it can stretch into a thin sheet without breaking, you 've kneaded enough. 4. Put the dough into a light buttered bowl. Let the dough rise in a warm place until double in size ( can be 1 hour and a half, check often depend on the temperature ) Take the dough out of the bowl, deflate by touch it lightly. Roll the dough into rectangular , 30X25cm. Sprinkle the bacon and cheese all over the surface of the dough . Roll into sushi roll and cut into equals part of 1.5 inches each. Place on a greased pan and leave it to rise for 10-15 minutes. Bake at 180C for 25-30 minutes until golden brown.